There are no massive city gates to welcome you here, or stone covered causeways over gigantic moats to traverse. 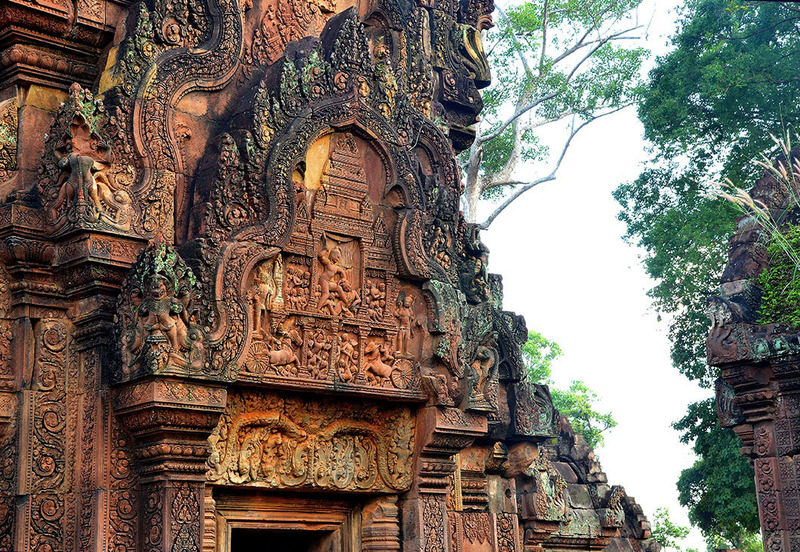 But what Banteay Srei – Khmer for Citadel of the Women* – lacks in monumental scale and significance, it makes up for with its exquisite sculptural adornment. Each intricate, carved inch of its centuries old, pink sandstone surface, proclaiming the supremacy of art over architecture. Glorious depictions of scenes from the Hindu epics, in styles almost more Indian than Khmer, are splashed across every lintel and pediment of the three shrines, and even a pair of libraries facing them. While door and window frames, mimic the filigreed intricacies of traditional woodwork! Some of the most elaborate carvings are to be found on the library pediments, a few of which, along with the Uma & Shiva sculptures from the central sanctum, have been removed to museums. The rest need to be viewed from behind rope barricades, erected in 2010 to contain damage. If you go, try and time a visit in the early hours of the morning, when the facade is illuminated by sunlight. We went late afternoon (having clubbed this with Beng Mealea) and although the light was wonderful, and brought out the colour of the sandstone, the sun directly behind the temple wasn’t ideal for photography. Until next time…………….happy travels, no matter where life takes you. *This name is attributed to the delicacy of the bas relief, implying that they were perhaps designed by women! The beauty is astounding! It had to have been designed by women. This really takes my breath away. The carvings are astounding enough. But the alignment of the carved blocks, boggles the mind Angeline! They are like intricate jigsaw puzzles! What a place! Those carvings are truly amazing. Absolutely fantastic details, this indeed needs to be preserved for today’s and future generations! I know just how wonderful Banteay Srei is, because I visited it for myself last year. It’s a magical place and you have perfectly captured the essence in your photos, Madhu. Beautiful! I’ve always wanted to go to Cambodia, and Siem Reap in particular. Until this, thanks for the lovely photos! That is a wonderful building. The stone carvings are beautiful and must have taken years to do. Imagine starting your day here among these treasures! Beautiful shots Madhu! Exquisite. I’ll go as soon as I have retired…Hopefully I’m still agile and healthy. Thank you for sharing these beautiful photos. Stunning! People do amazing things. I love Angkor Wat. It’s wonderful to wander through. Fabulous gallery Madhu and the new header is so intricate ! Beautiful curves and delicate traceries carved in the stone, did it feel feminine? Wow, fascinating, Madhu! Those carvings are just amazing! Very nicely preserved! Where is this I wonder, i.e. how close to Siem Reap? The extent of ancient Indian influence in Asia and the Pacific is enormous. Even though the age of the Rajas is long gone in places like Indonesia for example there are still traces of Sanskrit words in their languages. You have demonstrated how even architecture in other countries has been copied in these pictures. From what I can see, the lighting was still excellent when you visited. Wonderful photos, Madhu. Incredible art. Thank You showing them. The carvings are beautiful Madhu and you’ve captured the temples so well considering the light was against you. Wasn’t this a gem of a building, Madhu? I was almost beside myself, oohing and ahhing at every turn, unable to settle on which freize or niche to concentrate on! Luckily for me, a rainy night turned into a glowing dawn and the building glowed as though lit from within – I felt as though I was inside a jewel box! Intricate carvings and stood the ravages of time and man. Marvellous. Intricate. That’d take me time to wander and wonder and ponder on what the designs are telling. Ahihihi… Shadows, funny how it is an adversary for photography. I did have some pictures left unshared beause of shadows. I must catch up on your posts soon… I miss your blog! Sandstone should be too fragile to have endured, shouldn’t it? These carvings and the placement of the blocks are amazing. Banteay Srei looks really stunning, Madhu. I wish we’d had more time to have made it there when we were in Cambodia. Are you in SE Asia now?